Residents of Orangi Town say they can’t pray in Ramazan as there is no water to wash oneself. Children also shouted slogans in a protest in the area. “Pani do, Pani do [Give us water],” they said. A similar situation persists in Surjani Town Sector 7-C. Taps run dry at houses. Instead, they collect water from a reverse-osmosis (RO) plant. Even when supply resumes in the area, the water is brackish. Skin allergies are common in the area because of the quality of water. United Nations Development Programme and Pakistan Council of Research in Water Resources reports say Pakistan will reach absolute water scarcity by the year 2025. 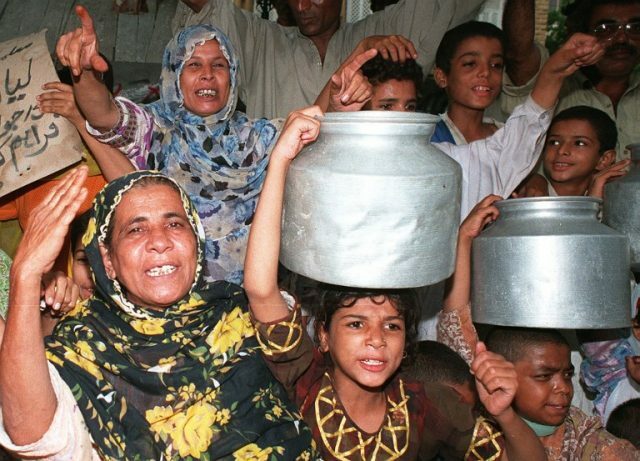 Water shortage is common in Pakistan, especially in port city Karachi, where summer months bring about increased power cuts coupled with severe water shortage. Heatwaves aggravate the situation and protests often break out over water deprivation in poor neighbourhoods. On Monday, the Chief Justice said that finding a solution to the country’s water crisis is the Supreme Court’s top priority now.